Jean-Claude Juncker denied on Tuesday (8 July) that he favoured a federal European superstate as he sought the support of British Conservatives and other Eurosceptics for his presidency of the European Commission, but his assurances drew a cool response. The designated head of EU executive delivered his message to the European Conservatives and Reformists (ECR) group in the European Parliament 10 days after British Prime Minister David Cameron failed to block his path to Brussels’ top job. “Despite what you may read in the British press, I do not want a United States of Europe,” the former Luxembourg prime minister told the lawmakers, according to one person present. As he visited the main political groups to explain his vision, Juncker, 59, attempted to show that he had understood some criticism levelled by Eurosceptics at Brussels. 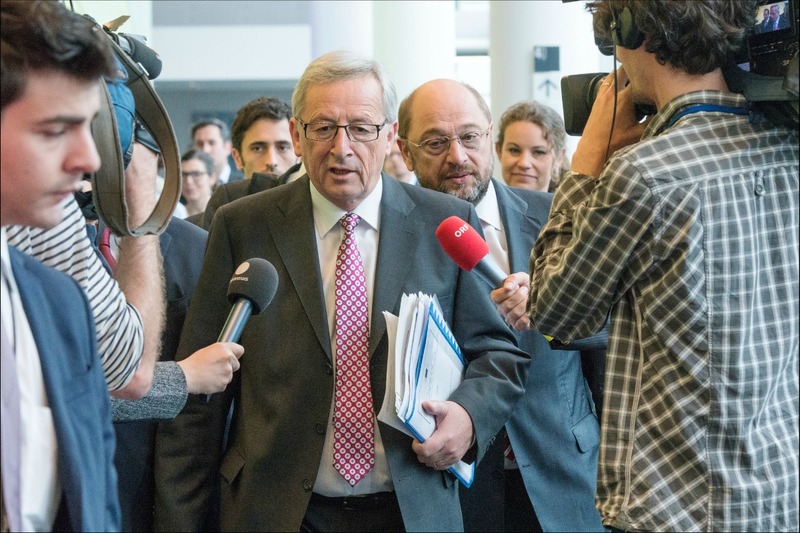 Speaking after the meeting, the leader of the 70-member ECR group said that while they had given Juncker “a fair hearing” there were still areas of disagreement. “We have had a robust exchange on a range of issues,” British Conservative Syed Kamall told journalists. After the hearing, Kamall made clear that the ECR would not support Juncker. “We cannot subscribe to the process that brought Mr Juncker to this point. We believe it represents a shift of power away from the Member States and towards the parliament, and that there is a false linkage between people voting primarily for national parties, and the candidates that pan-European parties put forward for the commission presidency” – Syad Kamall. If, as expected, Juncker is endorsed by a majority in the European Parliament on July 16, the ex-Prime Minister of Luxembourg will hold office for five years, beginning in November, taking charge of an institution responsible for proposing EU law and policing existing rules. The Commission also leads trade negotiations and a vice-president coordinates the EU’s common foreign policy. EU leaders nominated Juncker last month despite opposition from Britain, which depicted him as an old guard federalist and Brussels insider, unsuited to the task of shaking up the executive body which proposes and enforces EU laws. Resolving the British question promises to be one of his most delicate tasks. Prime Minister Cameron has promised to renegotiated the UK’s relationship with the EU, and put the outcome to an in/out referendum in 2017 if he is re-elected next year. Cameron has said he will back continued membership, provided Brussels agrees to reforms ranging from cutting red tape to tightening rules on migration within the EU. UK Prime Minister David Cameron has waged a very public campaign to block the former Luxembourg Prime Minister and EU veteran Jean-Claude Juncker from becoming the next President of the European Commission. Juncker is seen as the legitimate candidate for the post because he campaigned during the European elections as the leading figure of the centre-right European People's Party (EPP), which won the largest number of seats in Parliament. Most EU parties have accepted this logic but Cameron refused it, saying Juncker's candidacy did not appear on the ballotpapers at the May EU election. He insisted that EU heads of states and government take a vote on the matter during an EU summit on 27 June, knowing he does not have a blocking minority. Cameron has promised Britons an in/out referendum on Britain's EU membership if he is re-elected in 2015 and said he would push the vote forward if Juncker was appointed. Is this because he don’t want a federal structure ? Or because he don’t want an E.U. President directly elected from Citizens ? Well then i don’t really know for what is the sense of reforms that Europe needs ! This means we are further takling the economic in intergovernmentalism ! Thought that Juncker would advice federal prerequisites for the EMU ! Obviously he lacks Solidarity like Merkel ! Sorry but believe in Renzi ! As an E.U. citizens I am very disappointed to hear this ! Viviane Reding told that we need a United States Europe in Passau and talk even from Juncker on this matter! Then I ask me for what do we have the so called Réunificatio of Europe ? For what we need a Council or E.U. institutions ? For what the sense of a single currency or speaking about single economy when there is no Solidarity ! What is the Endpoint of the Reforms of Europe ? America have their government fixed but Europe still egoistically neverending reforms everything included his own institutions ! For what then ? Where has the European dream gone when there is no Solidarity and solidity for all ! Wouldn’t it be better to dismantle ? Is that the sense to continue with a splitted Europe ? I think in don’t need to vote anymore for Europe ! Kamall made clear that the ECR did not support Juncker. Well, what a surprise. A bit like Japan not supporting a ban on whaling. In Kamall’s case, I’m just so upset. Juncker does not envisage a United States of Europe. Nor should he. Europe must find its own shape and form, and can never just copy something else that has already been done elsewhere. It’s going to take a lot of searching and discussing before a form or shape can be found and agreed upon that will represent a united continent, but sooner or later a start must be made. The solution to that problem will however, be unique. No! I suggest the Germany could remain the €uro currency ALONE ! Well we will see if one day all /sick of Germany/ Member-states are beginning to re compensate it’s economy with their own currency ! Because that is what will happen ! be unique ..Still how many Years ?? No Alexander Hamilton or the Treaty of Philadelphia is unique ! This could happen with one day to another by the WILL of european Leaders and not by their shelfish interests in which their are acting now ! If not and we continue the same path with no comittement of an United Europe then we can blew this known Situation away! As usual, “an european” undermines the European Union. Why should the EU slavishly follow the model of a country which is not even in our continent? Why should we ape the heroes of some other part of the world? Europe has its own political heritage and history, and we should be proud of that. It is on the basis of Europe’s traditions, history and social and economic realities and needs, which are quite different than those of the US, that we should build the European Union. All those who think the European Union should just ape the United States are doing Europe an injustice. There is also the unexplained reason as to why copying the United States model would actually be of benefit to the people of Europe. I doubt it would. I prefer to create a European EU, not an American one. This is probably why Britain’s contribution to the outgoing Commission – Baroness Ashton – has been so unimpressive in the post of high representative and why auditors found that the External Action Service, under her lead, has been unable to develop satisfactorily. It’s quite simply ! Not only the United States of America but see Germany Swiss have at least a federal Structures! What we are doing on our own is not slavishly following the Model of a Country (U.S) but Europe is merely following slavishly the slavage on some its Countries itself ! To be keen on Some’s countries Interests ! Well the split on to get back on what every Countries belongs back ! Spains economy should remain on it’s compatible currency because no EU Leaders wants a single economy ! About the United States ..Yes I’m proud seeing the economy the jobless rate andd finally how proud Americans are with their flag of the Unity ! And here we are fighting with our selfintersts find our proudness back ! Applies to the Euro-zone only ! By the way.. I don’t shame if i say that i am a federalist unlike Junker ! What he did is a kind of blaming to federalists! Let us assume that you have achieved your dream – the United States of Europe complete with armed forces. Explain the defence and foreign policy of the US of Europe towards Russia. At present the hard power – guns and planes are provided by Nato but Russia only has a small border with Nato – Norway, Estonia and Lithuania. The EU is trying hard to persuade Russia that the agreement with Ukraine is purely about trade and that Ukraine will never be in Nato. Under your scenario everything changes – Nato has gone and the EU is an armed state complete with army , navy and a nuclear deterrent. Explain how that new scenario will lessen the chance of war with Russia. What is the position of Finland? Or of Ukraine? about Dream :” United Europe” is enough but i talked about the Euro-zone only ! Please don’t mix ! I remember in a speech or press that Rasmussen was against an common European defense because he thinks then his NATO the is superfluous and i really can say you ! Do we Need a Nato after all ! Still Yes allied with The U.S. & the big Europe & the U.K. and not a stakes of Flags ! Who is and remains dictating still Europe ? NATO and it’s U.S. of A puppets! Another Subject most important is that actually Europe with no common defense strategy is defenseless for sure ! Actually I didn’t made any Position about Finland or Ukraine ! Can we all remember that Juncker has admitted that when the going gets tough he is happy to lie. So where are we? Perhaps in a dark cave or room! When the going gets tough every politician is prepared to lie. Politics is not about some eternal truth but about keeping the country together, while pursuing the policies you aspire. A politician who cannot lie is like a gambler who will not spend money, he just won’t get very far. In an ideal world politicians, when elected, will specify their promises and sign for them in contractual form. That could be a target for the future but is not a reality in the present. What Schulz probably meant to say is that he doesn’t support federating Europe in the image of America. But I’m sure this old dog will still have a few tricks up his sleeve. Let’s just wait and see what happens once he really takes on the position. “every politician is prepared to lie” is a quite staggering thing to say. Perhaps you meant dissemble evade or conceal? For instance if during an election the leader of the opposition , who knows the public finances do not balance, is asked. A. “No I will not raise taxes.” That is a lie. I think we understand that politicians do not like to say unpopular things so they evade but lying is something else. You turned Junckers words as YOU like to hear or write ! “when the going gets tough he is happy to lie ” ??? He never said that word happy in that sentence !! Lie and lie are 2 meanings ! He said this after the crisis that the crisis itself wasn’t that worse than a lot of people pretended to be after the U.S. collapse& housing to appease all theses panic makers investors – an he had right ! !